Little Miss and Little Man share a bedroom. Little Miss is 12. Little Man is 6. Yet I break up arguments and referee fights often. Late last night I heard bickering WAY after I had tucked them in. "MOM. Little Miss won't shut her PINEAPPLE." (Incidentally-I win the mom of the year award for thiis picture. 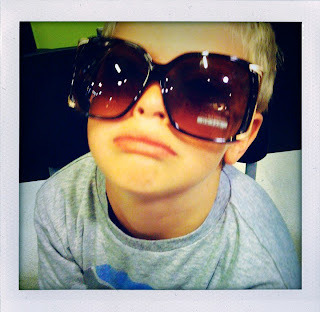 We were at the store with my little sister when we caught him trying on these glasses. He didn't want his picture taken in them though. It was one of those "If you want ice cream you better do this rediculous thing I'm asking you to do and smile while you're at it" kinda thing.